Cummings Plumbing Inc. is one of Tucson’s largest plumbing, septic, heating and cooling service companies. Cummings Plumbing is upgrading to a new Windows server, and to a new logistics database designed by me. Cummings Plumbing Inc. is one of Southern Arizona’s largest contractors, with over 60 employees, 70 trucks and 5 generations of combined plumbers, septic technicians and air conditioning experts. 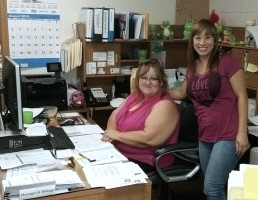 These lovely ladies are Terrie, office manager, and Sonya, in accounting. Cummings delivers the highest quality of service in Tucson, Oro Valley, Sahuarita, Pima County and surrounding communities.